HomeAid Executive Director Kristyn Burr and Final Salute Founder Jas Boothe celebrate the completed renovation of Karen’s Home in Alexandria. This 8,700 square foot house will provide housing for 10 formerly homeless female veterans and their children. Alexandria, Va. – July 17, 2018 – Ten formerly homeless female veterans and their children now have a newly renovated and expanded residence to call home, following the completion of a collaboration between Final Salute and HomeAid Northern Virginia to transform Final Salute’s residence in Fairfax County. 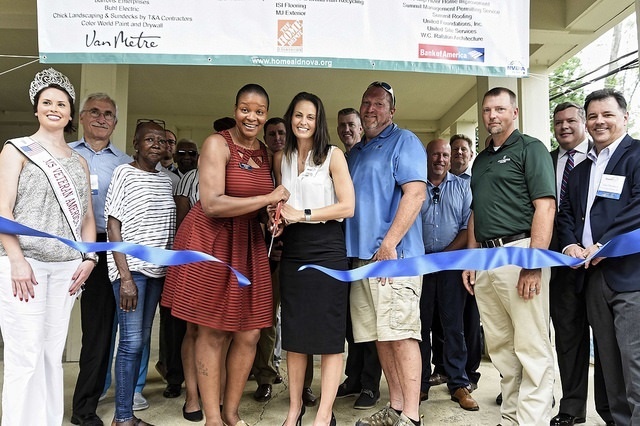 Final Salute provides safe and suitable housing to homeless women veterans and their children; HomeAid Northern Virginia builds and renovates homeless shelters and housing facilities via the donated expertise, labor and resources of local homebuilders. The renovated home will provide housing for up to 10 female veterans and their children who are struggling with homelessness. “All too often, supportive housing programs for veterans aren’t tailored to the needs of women veterans, and in particular, single-mother veterans raising children,” said Jaspen (Jas) Boothe, founder of Final Salute. “Female veterans are among the fastest growing population of the homeless. Yet more than 60% of programs that take in veterans don’t take in women, or don’t take in women with children, or have age limits on the children or have limits on how many kids you can take.” Final Salute provides transitional housing suited specifically to the needs of female vets, and their children. The official dedication ceremony and “ribbon cutting” was held today at the Fairfax home. Jas, an Army veteran who set to deploy during the Operation Iraq Freedom/Operation Enduring Freedom campaigns, faced homelessness herself when she lost her home to Hurricane Katrina and was simultaneously diagnosed with an aggressive cancer. She learned by direct experience that there were few veteran programs willing and able to provide assistance to her and her son. Since founding Final Salute in 2010 as a way to provide support to other female veterans like her, Jas and Final Salute have served more than 2,000 across 30 U.S. states and territories. The Final Salute home called ‘Karen’s Home” in Fairfax County provides 8,700 sq. ft. of living space that can accommodate up to 10 female veterans and their children. Prior to renovation, the house had seven bedrooms and five bathrooms. With the renovation led by HomeAid and its “builder captain” Winchester Homes, overall living space was reconfigured to eight bedrooms and eight bathrooms. The kitchen and bathrooms were upgraded, new fixtures added, a new deck and pergola built, storage areas expanded and the overall layout of the home was optimized for residents. Additionally, a previously under-utilized area of the basement was converted into living space – with a bedroom, bathroom and kitchenette – for a residential manager to provide ongoing, onsite services to house residents. Of the estimated $650,000 cost of the renovation, 85% was donated by HomeAid, Winchester Homes and the construction trade partners – electricians, plumbers, and a range of other subcontractors, etc. – participating on the project. The project with HomeAid Northern Virginia enabled Final Salute to complete the much needed work on its residential property for veterans and, importantly, enabled the organization enables to invest more of its budget in programs and services for women veterans and their children, rather than in construction costs. Final Salute received a grant from the Flatley Foundation, and HomeAid received funding from the following specifically for this major undertaking: Bank of America Charitable Foundation, Van Metre Companies Foundation and the Home Depot Foundation. See more photos of our ribbon cutting ceremony here. HomeAid Northern Virginia, a chapter of HomeAid America, engages the resources and interests of the homebuilding community and its corporate partners in order to undertake new construction and major renovations to properties owned by service providers that help homeless people gain stability and get back on the road to self-sufficiency. The organization was started in 2001 by members of the Northern Virginia Building Industry Association (NVBIA), and since then, has completed 124 projects valued at a total of more than $15.7 million with $9 million of that seen as savings to the non-profits we serve. The mission of Final Salute Inc. is to provide homeless women Veterans with a place to call home. Final Salute Inc. is the only non-profit organization in the DC Metro Area that offers housing assistance exclusively to homeless women Veterans and their children. Since its founding in 2010, the organization has provided more than 10,000 days of housing serving women veterans and their children. Among many national recognitions for this important work, founder Jas Boothe has received a Standing “O”vation from Oprah Winfrey and Toyota and been recognized as a CNN Hero and People magazine Hero Among Us. Learn more and support Final Salute by visiting www.finalsaluteinc.org.